After a day like today Spring is definitely on it's way. It was sunny, there was heat to the sun, the birds were chirping, the snow is melting and it was a true gift from God. I painted the matchbox Trail Tan inside and out. I added some burlap from my stash to the top. I made a gold wire nest, made some polymer tan coloured eggs then used a toothpic to add a few dots in brown ink to make them look more natural. I didn't have any feathers so I made my own. I drew a feather shape onto white cardstock, coloured with 2 different browns and a tiny bit of black pencil crayon then I used a craft utility knife on my cutting mat and sliced thin slits. Some chunks of paper sort of came off but then I didn't mind it as they acutally looked like real feathers so I added them and stamped a little tag with a birdie and attached it with some fine gold thread to the nest. I can't show you the inside as it is packed with birdie goodness for my swap partner. Sure hope she likes it. This was fun and got me in the spring mood. You should click on the link provided to visit our group to see all the creative matchboxes. Everyone is doing their version of nests, it has really caught on to everyone and each one is so different and very beautiful. If you want while you are there, sign up, everyone is welcome. This is beautiful! I love how you've made your feathers by hand, and the lovely little wire nest and birdie tag. Such a tiny, sweet little package. This is so sweet les! Love your little handmade nest and eggs! This is so beautiful! I really love this! 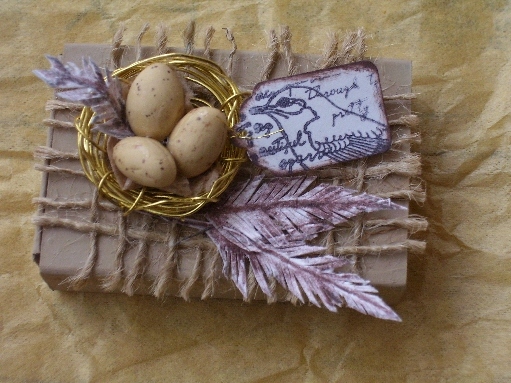 What a neat Matchbox project- love the birds nest- Love it! Lesley those eggs are so realistic. So adorable with the little eggs and feathers. I love the matchbox..with the little eggs and nest and things. Really cute. I love the little eggs! Great project. Love the matchbox but love your more! So pretty! Love the nest! I love your little match box. I am fan of birds nest and little winged creatures. I love how they make their nests from found items and weave it ever so creatively! I am having a Big Spring sale in my shop for a short time only ..everything is 50% off. I would love for you to drop by and check it out!